Jollibee’s sweet style spaghetti sauce-now the tastiest and meatiest ever from Jollibee! With the chunkiest slices of savory ham and sausages, loaded with ground beef, served over premium quality noodles and topped with lots of cheese. 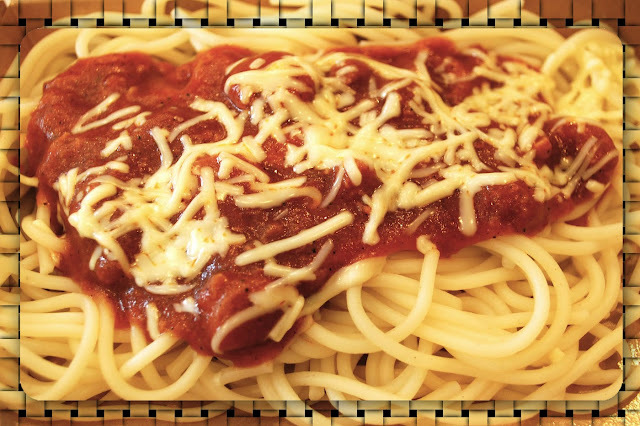 Jollibee Spaghetti – the Spaghettiest! 2. Add the tomato sauce and ketchup. Add a cup of beef broth and let it simmer on low heat. Make sure to stir it so you won't burn the bottom. 3. Add the hotdogs, ham and salami. Let it simmer and allow all the flavors to fuse. Pour the pineapple juice or juice from pickled relish. Add sugar, salt and pepper to taste. If you want it sweeter, you may add more sugar. 4. Boil 5 liters of water with 1 tablespoons of cooking oil and 1 tablespoon of salt. Add 1/2 kilo of spaghetti pasta to cook and stir continuously. 5. Drain when al dente. Chill the pasta by shocking it in a bath of ice water to stop the cooking. Then drain the pasta thoroughly. 6. Put pasta in a serving dish and make portions. Pour desired amount of sauce over cooked spaghetti noodles. Grate some cheddar cheese on top.